How do we talk to our children about the shootings of young black boys and men that rise up to confront us? We need doorways into that challenging and heartbreaking space. 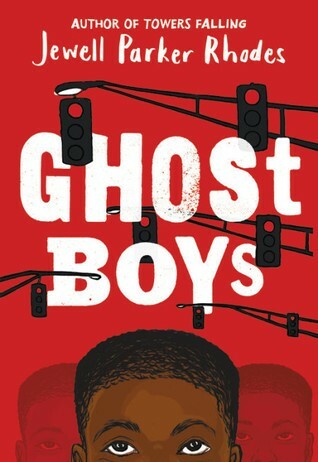 Here comes a book that offers a chance to walk with the families and feel what they feel and to look at the line of ghost boys who are still waiting for someone to hear their truth. Eddie, Mike and Snap are the bullies that terrorize Jerome's middle school He's learned the rules. He keeps his head down and keeps to himself, risking no friends. Until the day he meets Carlos and decides to hang out with him. Lunch time rolls around and Jerome knows the ropes. He gets Carlos and their food and leads him off to the boys bathroom to avoid the bullying Jerome knows is guaranteed to happen if they stay in the cafeteria. When the three tyrants come into the boys bathroom stalls looking for Carlos, the new kid, Jerome knows they mean business. It's the usual drill with the threats and the demands until Carlos changes the balance of power by pulling out a gun. Suddenly it's the bullies who know Carlos means business and at least for now, it's the bullies who leave the bathroom in fear. They're gone. Carlos shows the gun to Jerome who is wondering how Carlos ever got it past the school metal detectors. Turns out it's only a plastic toy but it looked real enough to fool the bully team. Later that day, when Jerome plays with the gun at the local park, the cop who sees him thinks the gun looks plenty real, too. He shoots Jerome dead. Now Jerome, a ghost boy, comes back to watch his family as they struggle to deal with his death, and to watch the trial of the policeman who shot him and to watch and listen to the daughter of that policeman as she fights to understand how her own father could have taken this young life. Woven with sad history and the nearly invisible voices and stories of the list of ghost boys who have died in similar circumstances, this book explores the tragedy that touches all lives and offers the hope that the young minds and characters growing up around the United States today can learn enough empathy, enough compassion and gain the essential ability to accept the value of every human being regardless of race, creed and color so that the senseless violence will become the ghost of the past.